The sun is the source of the life on our planet Earth and, directly or indirectly, is the fuel for most renewable systems. Photovoltaic and solar thermal systems, as well as solar thermal power stations, convert solar irradiation directly into useable energy. Continuing our Fundamentals series, Volker Quaschning gives an overview of the solar energy resource. Various different terms are used when dealing with solar radiation. However, these terms are often used incorrectly, even by some solar specialists. The total specific radiant power, or radiant flux, per area that reaches a Spectrum AM 0 (extraterrestrial) Spectrum AM 1.5 (terrestrial) receiver surface is called irradiance. Irradiance is measured in W/m² and has the symbol E. When integrating the irradiance over a certain time period it becomes solar irradiation. Irradiation is measured in either J/m² or Wh/m², and represented by the symbol H. For daylighting purposes, only the visible part of the sunlight is considered. The analogous quantity to the irradiance for visible light is the illuminance. This uses the unit lm/m² (lumen/m²) or lx (lux). It is the surface temperature of the sun that mainly characterizes the solar spectrum. This spectrum defines the corresponding spectral irradiance for all wavelengths of sunlight. Visible light, with wavelengths between 0.4 µm and 0.75 µm, has a 46% share of the spectrum, infrared light 47%, and ultraviolet light only 7% (see Figure 1). The earth’s atmosphere reduces the irradiance that reaches the earth’s surface. Ozone, water vapour and carbon dioxide absorb radiation with certain wavelengths as it passes through the atmosphere. The significant reduction in mainly the ultraviolet and infrared parts of the spectrum is a result of this absorption. Other atmospheric particles reflect or scatter sunlight. Only a part of the extraterrestrial beam irradiance reaches the earth’s surface directly (see Figure 2). The scattered part of the irradiance has no direction. Only direct irradiance can be used for concentrating solar systems, but non-concentrating systems can also use the scattered, or diffuse irradiance. The so-called global irradiance Eg on a horizontal surface on earth consists of the direct Edir and diffuse irradiance Edif. On a tilted plane, there is another irradiance component Eref, which is that component reflected from the ground. The average ground reflection is about 20% of the global irradiance. Hence, the irradiance Etilt on the tilted plane consists of three components, Etilt = Edir + Edif + Eref. A surface perpendicular to the incoming direct sunlight usually gets the highest possible irradiance. Normally, it is below 1000 W/m²; higher values are only possible in particular situations, such as if snow or clouds reflect sunlight onto the receiver surface. If the sun is perpendicular to the earth’s surface, sunlight only has to pass through the air mass (AM) of the atmosphere once. Therefore, this state is called AM 1. In all other cases, the route of the solar radiation through the atmosphere is longer. This way depends on the sun’s height. AM 2 indicates that the path of the sunlight through the atmosphere is twice AM 1. This is the case if the sun is 30° above the horizon (gS = 30°). In general, the definition of the air mass is AM = 1/sin(gS). Figure 3 shows the variation of the air mass during the year for Berlin and Cairo at solar noon – that is, the time during a day with the highest sun elevation, which depends on longitude, latitude and date. It is obvious that in Cairo the air mass is always lower than in Berlin. This is the angle between a line that points from the site towards the centre of the sun, and the horizon (see Figure 4). The zenith angle is the opposite angle to the sun height (90° – gS). At a sun height of 90°, the sun is at the zenith and the zenith angle is therefore zero. The sun azimuth aS is the angle, measured clockwise, between geographical North and the point on the horizon directly below the sun (at the end of a line running from the centre of the sun to the horizon). Figure 5 visualizes the sun angles, azimuth and tilt angle to define the position of a tilted surface. The angle of incidence q depends on all these angles. As mentioned above, the maximum irradiance can usually be obtained by a surface that is perpendicular to the sun. Since the position of the sun changes during the day and year, only a two-axis tracked surface gets the maximum irradiation. The annual irradiation can be more than 30% higher than on a non-tracked surface, while for a one-axis tracked surface the irradiation gain will be in the range of 20%. Near the equator, the optimal orientation of a non-tracked surface is nearly horizontal. In the Northern Hemisphere, it should be tilted towards the south, and in the southern hemisphere, towards the north. The optimal tilt angle increases with higher latitudes, and is higher in winter than in summer. Outside the atmosphere, the annual solar irradiation is about 12,000 kWh/m² (8760 h at 1367 W/m²). At every site on the earth, half of the year is night, with no sunshine. The atmosphere reduces the irradiance at least by 25%. Clouds and dust cause a further reduction. The best sites on earth, in extreme desert areas, receive an annual solar irradiation which can be more than 2500 kWh/m². On the other hand, there are cloudy sites at high latitudes with an annual irradiation far below 1000 kWh/m². On-site measurements are the only way to estimate the solar potential for solar systems. 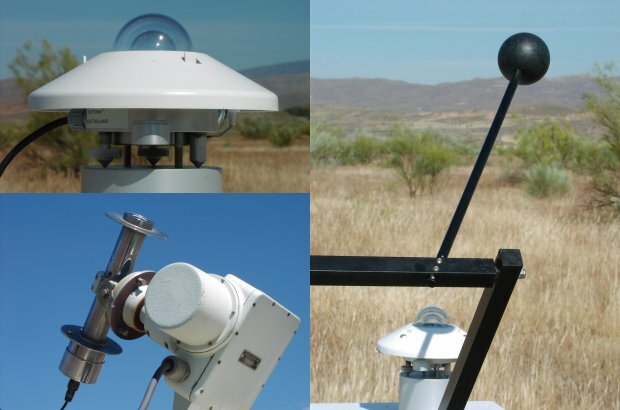 Different types of sensors exist to measure the solar irradiance. A pyranometer measures the global irradiance. Different designs offer different levels of accuracy (see photographs). Low-cost pyranometers use silicon sensors with a small photovoltaic cell that generates an electrical current that is nearly proportional to the solar irradiance. However, these sensors measure only part of the solar spectrum – they cannot sense infrared light. The annual accuracy of these sensors is limited because the spectrum changes with the air mass. In the ideal case error margins be of the order of 5%. More precise pyranometers use a black receiver plate that is mounted below a double glass dome. This plate heats up depending on the incoming irradiance. A thermocouple converts the heat difference between the plate and its surroundings into a voltage signal that is proportional to the irradiance. These sensors can obtain annual error margins of less than 3%. To measure the direct normal or beam irradiance, the sensor is mounted inside the end of an absorber tube (this tube keeps the diffuse irradiance away). This so-called pyrheliometer has to be mounted on a two-axis tracker that follows the sun very accurately. If a shading ball, or shading ring, permanently shades a pyranometer, it measures the diffuse irradiance since direct irradiance is kept away. However, careful maintenance of all sensors is necessary in order to obtain high levels of accuracy. Dust on the sensors, inaccurate trackers or dirt can reduce the measurement quality significantly. In the worst case, measurements can be totally useless! Meteorological satellites can also provide irradiance data. Half-hourly meteorological images are compared with clear sky pictures. The result is a cloud index for the whole satellite image. Finally, models that consider the position of the sun, water vapour and aerosols provide the reduction of the extraterrestrial irradiance on the way through the atmosphere. The annual accuracy of satellite measurements compared with ground measurements is not bad, and can exceed 5%. Since the variation of annual irradiations from year to year can be well over 20%, a measurement period should cover at least 7–10 years. Carrying out a measurement campaign over such a long time period is unlikely to be possible before planning and installing a solar system, so irradiance data can be taken from existing databases. Local irradiance maps or atlases offer information on annual or monthly irradiance. In many cases, local weather services can provide very detailed data. However, this data is rarely available free. The Meteonorm software (www.meteotest.ch) includes the largest commercially available database of irradiance data with some thousands of sites around the world. Some internet databases offer free irradiance data, while the US National Renewable Energy Laboratory provides 239 free hourly data sets of the US (rredc.nrel.gov/solar). The World Radiation Data Centre (wrdc-mgo.nrel.gov) and NASA surface meteorology resource website (eosweb.larc.nasa.gov/sse) offer additional global irradiance data. Finally, the European projects S@tel-light (www.satellight.com) and SoDa (www.soda-is.com) provide exhaustive data for Europe. With irradiance data that describe the availability of the fuel for solar systems the planning and prediction of the energy yield of solar systems is possible. These aspects will be discussed in later articles in this series.